Tasteful design, combined with a unique combination of style, value and preferred amenities make travel in the Sunseeker comfortable and loads of fun. Sunseeker’s unique split level design provides maximum headroom in the living area, while still offering pass-through storage on every floorplan. 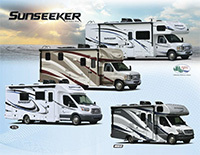 Plus, all Sunseekers are “Certified Green” by TRA Certification.